Take 10% off Sigmabeauty.com when you use coupon code FEB2014 at checkout. You also get a free gift when you purchase 30$ of more worth of product. I love Sigma brushes. They are the only ones I use. Plus they have so many new products on their site, so let me just show you my MUST HAVE makeup brush set (Seen below) Um can we call this heaven? 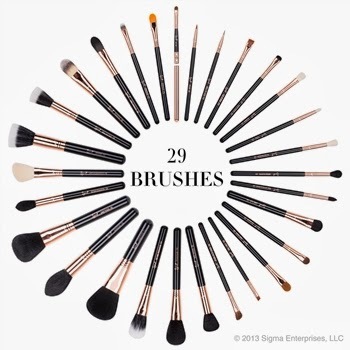 For $429 you can get every brush Sigma sells in one collection. Who wants to buy it for me!?!? Remember to click on the links to buy your Sigma brushes and help support my site!! SigmaBeauty is #1 for all cosmetic brushes and coupon codes. The Extravaganza Collection is a lavish assortment of hand-crafted brushes with luxurious, specialty-plated ferrules. The Extravaganza Complete Kit – Copper features 29 of our best-selling brushes with hand-polished, 100% pure copper ferrules and comes in a deluxe carrying case, perfect for traveling and storage. Everything you need for a luxurious makeup application. E15 - Flat Definer: Sharp and precise application. Press product along upper and lower lash lines to create an easy thin liner. Works with gel, liquid or powder products. E20 - Short Shader: Concentrated color application. Apply color onto small areas of the eye such as the outer eyelid. Also use to smudge the lower lash line. E25 - Blending: Controlled blending. Blend colors together onto the lid with added control. Buff out harsh lines for a well blended effect. E35 - Tapered Blending: Controlled application of crease color. Using just the tip of the brush to pick up color, apply directly onto the crease and sweep through. Effect is blended, but defined. F25 - Tapered Face: Exact product placement onto cheeks. Apply powder, blush or contour shades onto the cheeks and temples. Tapered shape gives exact placement of product. F55 - Small Duo Fibre: Creates a controlled airbrush effect onto the skin. Use with cream or powder blush and highlighting products. F75 - Concealer: Precise product placement. Use around the lip area to conceal when wearing bold lip colors. L05 - Lip: Precise application of color onto the lips. Use the firm edge to define and contour the lips.